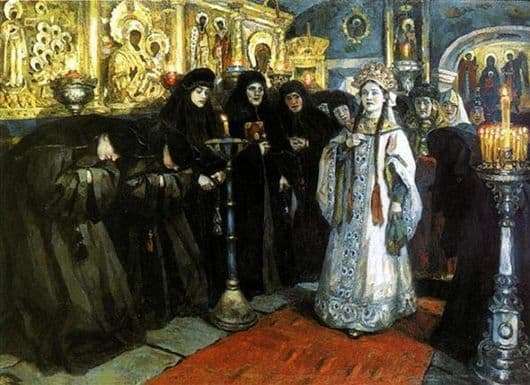 “A visit to the Tsarevna nunnery” is the last of the outstanding paintings of the greatest Russian artist Surikov. The canvas does not carry the meaning of a meaningful event, which was in reality in a certain period of time. It reflects, first of all, the very life and way of Russia before the ascension to the throne of Peter I. The picture tells the viewer about the joyless event. The fact is that in those days the religious foundations did not allow the princesses to marry. The proportion of girls from the royal family was unenviable – the only way for them was only going to the monastery. The princess visits the place where she will have to live all her life. More for her there will be no simple joys – over time, her thirst for joy will fade away for good. The artist diligently wrote the image of the princess. She is dressed in white luxurious robes that contrast with the gloomy dresses of the nuns. The skin of the princess is snow-white. It is clear that she is still young. Her face is the face of a child, rather than a young woman. On the face clearly readable naivety. Accompanying the princess befits her status. Right behind the girl is a lady market who monitors the necessary attributes of this procedure. The views of the nuns, still very young women, but nevertheless, already forgotten about the joys of life, look at the young princess with some envy. In their hand, each of them has a church candle. What kind of life expect a young girl? She does not expect anything joyful. It is not by chance that in contrast to her youth and beauty, the dry and joyless faces of young nuns are depicted. After a short period of time, the princess will become the same as they. Alas, but salvation from such a fate is not found. The young princess understands all this, and has already come to terms with such a need, but somewhere deep down she still hopes for a miracle that she will be able to avoid living in a monastery and she will remain in her usual way of life.